I'm used to stuff appearing at the door. Literally. Vitamin Water arrived the other day. One day it was apple chips. Once it was beer. 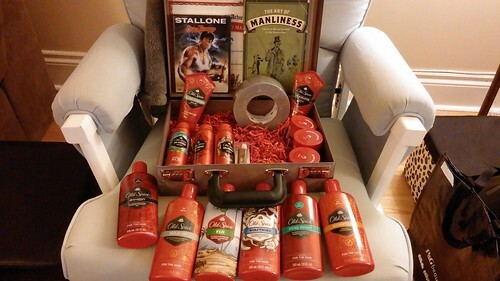 Yesterday, I received a package from Old Spice. Usually, when something arrives at the door, I'll tweet about it, but rarely will I write an entry about it. This "Smellcome to Manhood!" campaign by Old Spice is so damn impressive, I had to share. 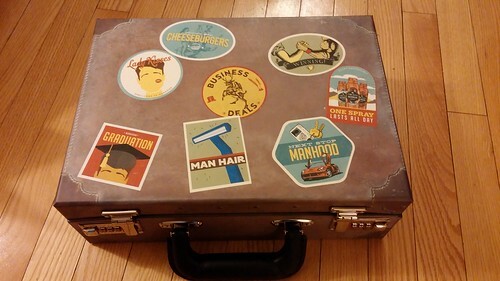 The goods arrived in a cool looking briefcase. My daughter excitedly opened the briefcase and found it was loaded with goodies. There was lots of shampoo, body spray, hair products as well as earbuds, an Over the Top DVD, duct tape, an Art of Manliness book, a flash drive and a Smellcome to Manhood certificate. Very impressive, Old Spice. This campaign is definitely blog-worthy. I'm kind of curious about the sorts of men's products people use, but it's not the kind of topic that usually comes up. I don't mind Old Spice antiperspirant, but I don't really have any brand loyalty in that department. I just avoid Speedstick antiperspirant and deodorant... doesn't seem to work as well as other brands. For shaving, fed up with the cost of cartridges, I switched to a double-edged razor years ago. Absolutely love it. I use Feather or Astra blades, and it costs somewhere around 5 cents for a new one every two weeks. My skin immediately improved too when I switched away from Gillette. I've tried tonnes of shaving products, but I can't imagine anything being better than Kent wool-fat shaving soap. You need a brush to use it though, heh. Being part of the concept team would have been a blast. What a neat campaign. 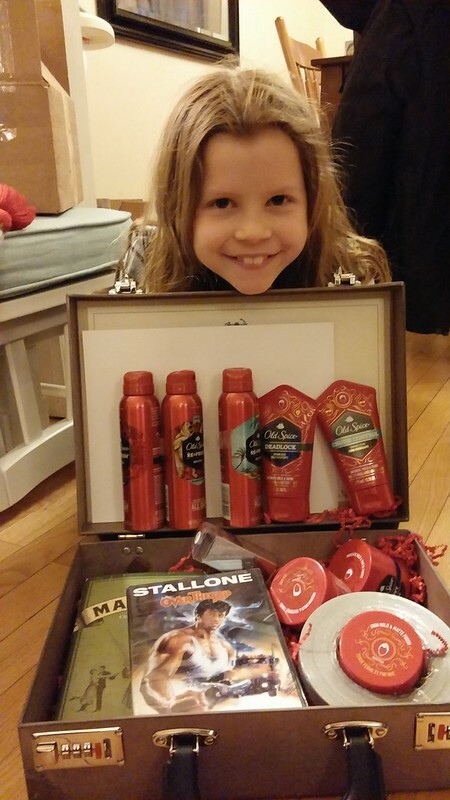 Forget the old spice... your daughter is BEAUTIFUL!!!!! That smile is perfect! This will drive CQ crazy Mike! In answer to markosaar's question of products used: other than deodarant and Adidas shower gel, this is the extent of anything I use. Most medical environments i go into daily do not want scented products used, and i think over time I have noticed people using less. I maybe wrong as the industry seems strong, but I just don't smell colognes/perfumes on people like i did 15 years ago. Maybe time to get the sniffer evaluated. By the way Michelle looks beautiful! CQ mentioned he doesn't have regular internet access recently. Old Spice sends Mike a whack of free product and other goodies, he mentions it on his blog and shows all the freebies, and now I'm supposed to go out and BUY these products? Genius. It's an awareness campaign. They hope "influencers" will tweet / blog / instagram / facebook it so others become aware the product exists. Okay, Old Spice, my interests is peaked. Im a dove 4 men guy right now. How would a common guy get his hands on one of these chests? how much is it going to cost? Phil - it's a promo. Doubt very much it'd be available for retail purchase. @Philly-Bob, you might want to try http://www.ggf.ca/attention.html A friend steered me on to them, but since I am a basic wash and wear Scot, just can't spend the time looking for these items. Damn! That's a nice haul.